Scoliosis is possibly the earliest evident affliction with which mankind was faced. The reason for this is that it is such an obvious physical problem. Early cave drawings dating back to the Stone Age point out that people at that time had scoliosis and were aware of crude forms of treatment. For centuries man has been baffled by the etiology of scoliosis and its management. Hippocrates was the first person to use the name “scoliosis” for any curvature of the spine, and he originated early methods of treatment. Over a thousand years later, Paul of Aegina attempted gradual scoliosis correction by binding the body to corrective splints. As early as 1582, Ambrose Paré instructed armorers in the development of iron corsets and cuirasses which were formed to the torsos of scoliosis patients in order to halt their deformity. During the Dark Ages little was done in the treatment of scoliosis, but toward the end of the nineteenth century Hessing established his reputation with corsets he developed to correct scoliotic deformities. 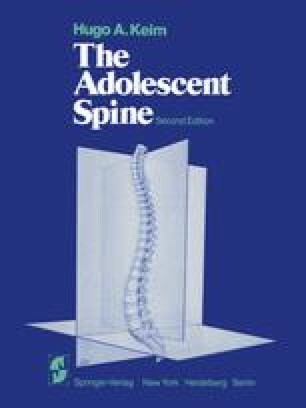 At the turn of this century, in 1914, the first scoliosis spine fusion was performed by Russell Hibbs at the old New York Orthopaedic Hospital.